Rome museum-guides.com - Rome, Italy museums guide Rome Vatican Museums information about Musei Vaticani, Raphael's Rooms (Stanze di Raffaello), Rome palaces, Loggias, Egyptian Museum, Sistine Chapel, location and address, tel / telephone number, and general information about Musei Vaticani in Rome (Roma) area, Italy (Italia) IT - Last updated 30/10/2012. The Vatican Museums (Musei Vaticani) are a group of Rome palaces which contain some of the most important, historic collections in the world. There are several major exhibitions at Rome's Vatican Museums (Musei Vaticani), which include the Etruscan Museum, Raphael Rooms and Loggias, the Egyptian Museum and the world-famous Sistine Chapel, which is probably the most important part of this vast museum complex. Other attractions at Rome's Vatican Museums (Musei Vaticani) include Raphael's Rooms (Stanze di Raffaello) - several rooms of the Vatican apartment that were painted by Raphael at the request of Pope Julius II. 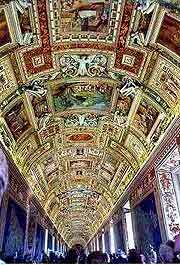 The Vatican Museums are part of Rome's Vatican Palace, the official Rome residence of the Pope. Containing painted ceilings, chapels, an around 1,400 rooms and many distinguished art galleries, the Vatican Museums house approximately 5 miles / 8 km of exhibits.